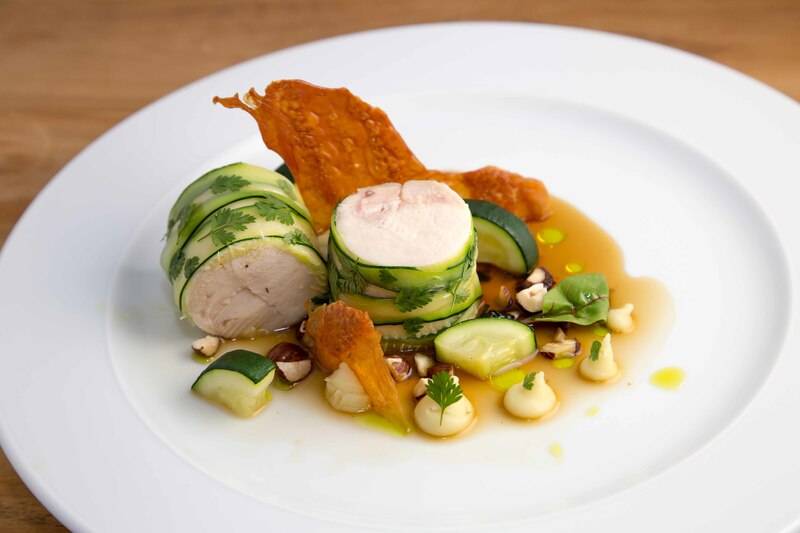 More riffing on the ballotine theme here with one wrapped in courgette. Of course the skin can never, ever, go to waste, so its crisped up to perfection and added back at the end! Crispy perfection with perfectly moist chicken in just 5 easy steps! 1. Using a Japanese mandolin or otherwise a sharp knife and a lot of dexterity, cut thin strips lengthwise of the courgette. Blanch in boiling water for 10 seconds to loosen up and bring out a brighter colour. Reserve a few pieces for garnish. 2. Cover your chopping board in cling film and place overlapping vertical layers of courgette with a width greater than the length of the chicken breast. Roll the courgette around the breast and the wrap the cling film over again to create a tight sausage shape. Keep rolling to tighten the ends and then tie off. Repeat for the other breast, then place in a souse vide at 60c for 2 hours. 3. Meanwhile take the skin and salt. Place between two baking sheets (or silicon mats if you have them) and put in an oven at 180 for 30 mins or until crisp. 4. Boil the potatoes until falling apart in well salted water. The salt seasons then and helps push more water out when drying which makes a better quality mash. When cooked, strain and let dry. Then pass through a ricer and add butter to taste. Season again. 5. Unwrap the cooked chicken and slice into rounds. Pipe or spoon some potato around as you wish and garnish with crispy skin, more courgette, chicken stock reduction and chopped hazelnuts. Au programme pour bientôt, ce wk peut-être !